Seaworld San Diego- A Frist Look at Explorers Reef. As part of Seaworld's 50th Anniversary, "A Sea of Surprises" the park in San Diego made some massive changes to their entrance plaza. While the Grand Opening of Explorers Reef isn't until March 21st, Seaworld San Diego has been opening the area slowly to guests. 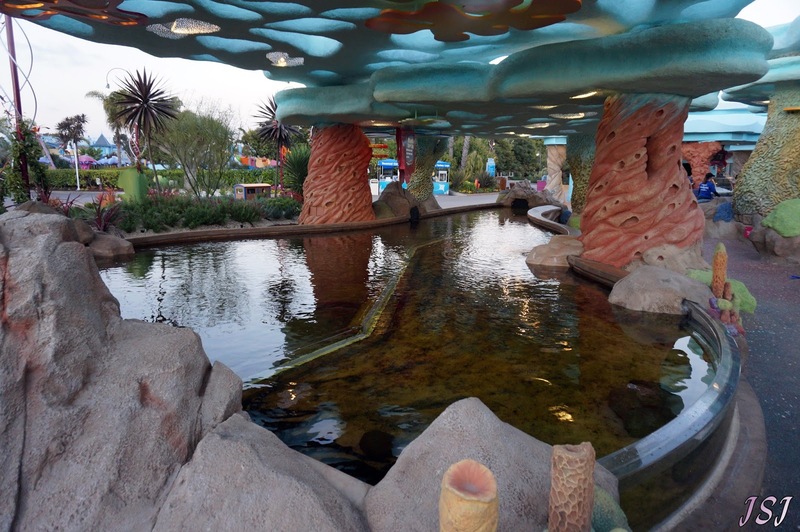 We where lucky enough to be invited to visit Seaworld San Diego but even more to our surprise the new area of Explorers Reef has just soft opened, much to our delight. Stepping into Explorers Reef you feel as if you've walking under the coral, exploring for yourself the many forms of aquatic life which lurk below. Each area is shaded with dappled sunshine, looking exactly like all those tropical coral and ocean wave pictures you spot from drivers. 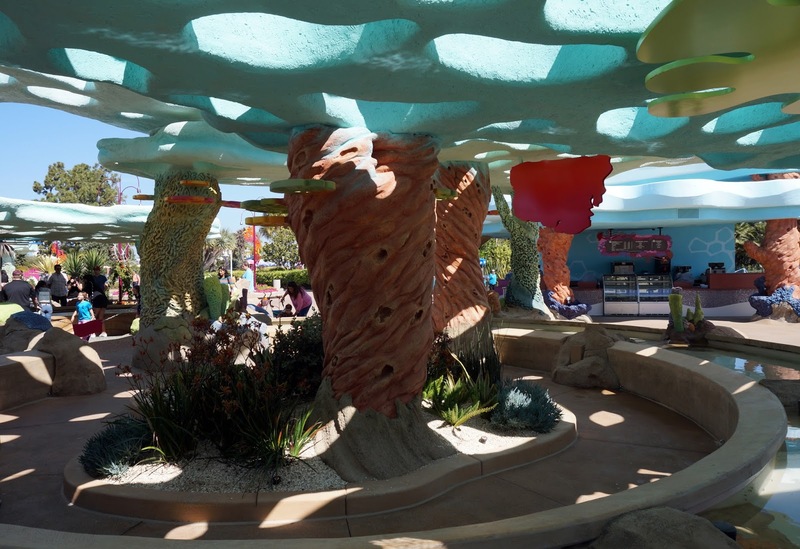 However, the real beauty in the design is the exhibits which hide underneath the "waves" and "coral". A series of huge "please touch" pond are below, overflowing with educators happy to teach you about the sealife within these pools. Already excited as we didn't know that this area had finally opened, we headed for the first very touch pool. We found this one full of tiny "cleaner fish" which do exactly as their name says. They clean both the tank and the curious hands of people brave enough to take the pledge. Needless to say, Alex and I wasted no time in diving right in while asking half a dozen questions a second at the surprised educator. While these fish are all new and still getting accustomed to their new habitat, they all seemed frisky and willing to explore the strange new appendages in their environment. Cute little things, a silvery and sandy color, they took a little to warm up to Alex and I. 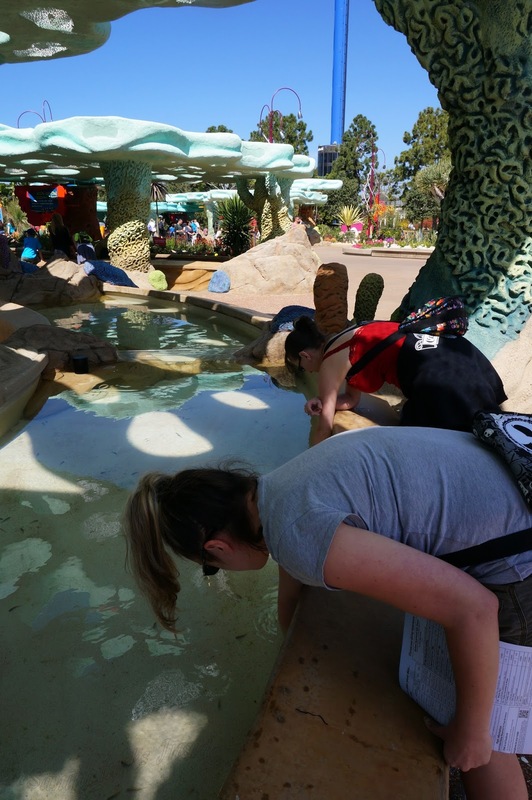 As the area wasn't busy this first day, we found out through our many questions that these tiny fish seem to enjoy hands with calluses and dry skin. Something we noted neither of us seemed to have, so we quickly divested our photographer Kitsune Hazard of the camera and stuffed his hand in the water. Let's just say he was highly popular among the cleaner fish! So there is a handy tip for all those visiting the cleaner fish, skip the lotion for a few days for a higher popularity count! Now having had our hands nibbled upon upto the elbow by fishies, we realized a small flaw. We're wet. 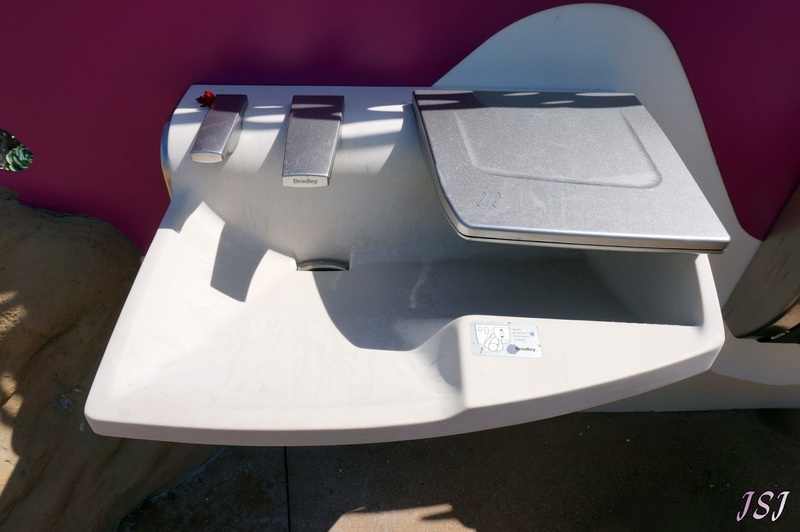 Seaworld really did think of everything, a helpful educator pointed us to one of several sinks. Complete with animal friendly soap, and air dryers. Pleased, we got ourselves all cleaned up and complemented the educators that the park really did think of everything. Yes. 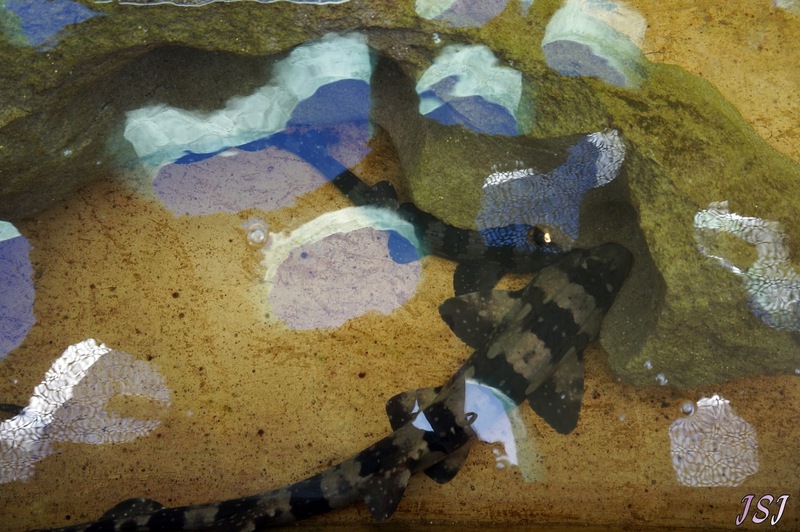 Real, live, tiny and adorable bamboo sharks where hiding among the shade in the very next touching pool. This kind of surprised us, cause touching a shark generally isn't something you think of doing. This adorable, fresh water sharks are really called "Hasselt's Bamboo Shark"(Chiloscyllium hasseltii)). Their peaceful little guys who tend to laze about in the shade and eat small shrimp, they're also very common in home aquariums and don't grow much above two feet long. After being assured our figures wouldn't be mistaken as an afternoon snack, we plunged our hands in with excitement. Yes, that's exactly what we said. They felt smooth and almost like leather, then the educator had us gently run out fingers in the other direction. This had a new feel, like find grain sandpaper. Smaller sharks feel rough like this but on larger sharks this feel can actually cut but exists for hydrodynamics! Already greatly pleased, we moved along the pool to the next exhibit. Stingrays, cute and tiny little guys with a few horseshoe crabs lurking around. Sticking hands in once again, we enjoyed touching the smooth but slightly slimy feeling critters. I must admit we didn't touch the horseshoe crabs, these prehistoric little buggers seemed to want all the attention though! Anytime we moved around the pool they seemed to follow along! Overall, Explorers Reef is simply beautiful. Both educational and inspiring to people of all ages who've ever wanted more interaction with creatures of the water. 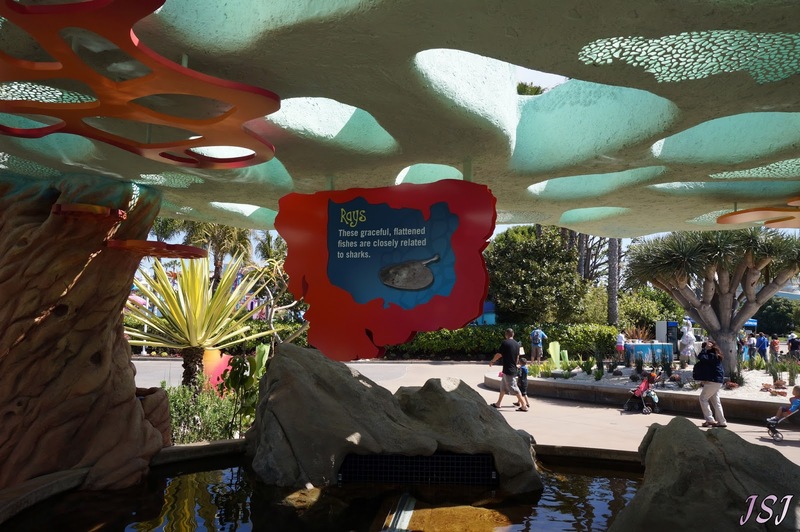 It really brings the entrance plaza of Seaworld San Diego to life, giving peoples first contact with the park one that is both interactive and learning friendly. We're pleased we got such an early look at the area during our visit, we only wish we had a longer day because we easily could have spent hours asking more questions and interacting these amazing creatures.